Kanchenjunga Base Camp Trekking, the one and only adventure in whole Himalaya where you will have the opportunity to visit its bothbase camps the south and the north face of worlds third highest Mt. Kanchenjunga that towers high above 8,586 m and 28,169 ft high. Kanchenjunga base camp trekking a marvelous walks with daily scenic views of high snow capped peaks that shadows the eastern Nepal hills and green valley on least trekked areas by main flow of trekkers and other visitors, an adventure into complete bliss and tranquil environment and in the harmony of mountains and remote isolated farm villages. The word Kanchenjunga which actually spelled Kanchendzonga in local Tibetan origin which means Five Jewels of snow clad peaks, truly fascinating and impressive mountains located at the Eastern rim of Nepal Himalaya range. Starting with breath-taking flight to land at warm eastern plain of Nepal, where drive leads to cooler alpine hills full of tea-gardens and views of mountains around charming villages of Ilam and then beginning our walk towards total wilderness. As walk progress past nice farm hill villages into deep dense woodland reaching at Ramche and Tserm with optional long hike to reach near about Kanchenjunga South base camp, the original and classic camps of early British Expeditions in 1955. From near south base camp with fabulous views of Wedge, Jannu and Kabru Himal with Kanchenjunga, walk leads into forested areas and crossing scenic passes to reach the other side North of Kanchenjunga at Pang-Pema within Kanchenjunga North Base Camp at 5,143 m high with mind-blowing views of peaks that surrounds you at North Base camp of Kanchenjunga. After an exciting and wonderful adventure visiting Kanchenjunga base camps then heading back to lower areas taking an alternative routes following the Kabeli and Tamue river downstream to Sukhetar and then drive to the airport at Bhadrapur for panoramic flight back to Kathmandu with marvelous memory and adventure on Kanchenjunga base camp trekking. 1 Day 1: Arrival in Kathmandu and transfer to hotels.On reaching Kathmandu Tribhuwan International Airport where you will be warmly received by our guide and staff and then transfer you to your respective hotels in the hub of Kathmandu city. First check into your hotel rooms on getting refreshed from the flight and with Jet-Lag, then join with other members of Kanchenjunga Camp Trekking for briefing, where our expert guides will inform regarding your stay in Nepal, hotels, trekking, local lodge-camping with do’s and don’ts information, evening welcome group dinner in authentic Nepalese restaurants with Folk cultural programs to entertain you during your meals. 2 Day 2: Morning sightseeing tour afternoon trek preparation.Morning after breakfast leave the hotel for exciting guided sightseeing around Kathmandu where our city guide will lead you to places of interest, Kathmandu a metropolitan city still retains its ancient heritage and varied ancient culture where you will visit world heritage sites around Kathmandu for half day or full day. After an interesting and wonderful tour of ancient historical and religious sites around Kathmandu, with afternoon free preparation for next day flight to Nepal Far East for Kanchenjunga base camp Trek. 3 Day 3: Fly to Bhadrapur 3000 m and drive to Ilam town - 04 hrs.Morning transfer to Kathmandu domestic airport for sweeping 45 minutes scenic flight to reach eastern south belt of Nepal, near India border. On reaching at Bhadrapur airport with exciting panorama of mountains with Everest and Kanchenjunga in view during airborne, here our trekking and field staff will receives you for a great drive into cool alpine areas to reach at Ilam town for first overnight stop. Ilam town famous for Tea and its huge garden of tea bushes with time browse around its markets and explore its colorful culture of Eastern Hill people of Nepal. 5 Day 5: Trek to Kheswa - Bhanjyang 2,100m - 05 hrs.Morning walk leads downhill through farm villages and maintained fields and terraces, around here the villages are mostly Hindu origins, a mixture of Brahmins, Chettris and the Kirat tribes of Rai's and Limbus who also practice Hinduism and as well their own old traditional culture respecting natural spirits. After reaching Tembawa village, then walking downhill towards Phawa khola, crossing Phawa khola coming to Pokora village, the trail from here leading unto terraced farm fields, and finally crossing a bridge, then climbing steeply to Kunjari a mid hills village, from here walking into a mixed forest then climbing up to a small farm village at Khesewa- Bhanjyang, with superb views of Kanchenjunga and Yalungkang peaks. 6 Day 6: Trek to Mamangkhe 2,030 m - 06 hrs.Journey begins descending after leaving this nice farm village towards farm area with rice and millets terraced, then entering a forest area to Nandeva khola, after crossing this stream, walk leads downhill along the river, then reaching a high hill with a climb into forest to reach at Lopoding village, from here the walks leads to ups and down until the walk reaches at Fun Fun a small settlement, from Fun-fun ridge top offers magnificent panorama of Khumbakarna Himalaya range with Yalung and Mt. Kanchenjunga. After marveling the views descend again through farm terraced, then start climbing on a gradual uphill for an hour to Pomppe Dhada on the crest of a ridge with awesome views of Mt. Jannu in the distance. From this high spot on the downhill path to Khesewa khola, then crossing a suspension bridge with a last climb of the day through terraced fields to reach Mamankhe village for overnight stop. 7 Day 7: Trek to Yangphudin 2,150m - 06 hrs.Morning walk begins with a gentle climb, skirting around the ridge to a level path that leads to Dekadin village. From this village walk leads along the right bank of Kabeli khola (stream) climbing from 200-300 meters high above from the river bed towards mountain trail, walking on the winding path around several ridges and small streams, then descending on stone steps towards Kabeli khola, leaving the river our trek leads to a climb passing through farm fields and villages, after a good walk of the day reaching a remote farm village at Yamphudin for overnight camp. 8 Day 8: Trek to Chitre 2,880 m - 06hrs.From Yamphudin village walking along the left bank of Kabeli khola, crossing a tributary stream of Omje khola and then starting a climb up to Dhupi Bhangyang into a wide open grassland, from the top of this small ridge a steady downhill through the deciduous forest to Omje Khola. Journey continues through rhododendron forest, and coming to an exposed ridge to our overnight camp at Chitre, a small settlement with only few huts. 9 Day 9: Trek to Simbua Khola 3,000m - 07 hrs.After a nice morning at Chitre, starting our journey towards Ramite Bhanjyang on the steep uphill through magnolias, rhododendron and bamboo forest then reaching at Ramite a place with a single hut, from here walk leads to a climb in a rhododendron covered uphill, then passing to a small pond on the right as it reaches Ramite Bhanjyang at 3,430 meters. After a break and admiring picturesque view of Mt.Jannu, walk leads to about 150 meters climb through dense forested area with rhododendron, pines and oaks trees with view of Mt. Kanchenjunga, Mt. Khumbhakarna and Kabru peaks in between the tree lines. From here walk is on gradual downhill to the riverbed of Simbua Khola for overnight camping. 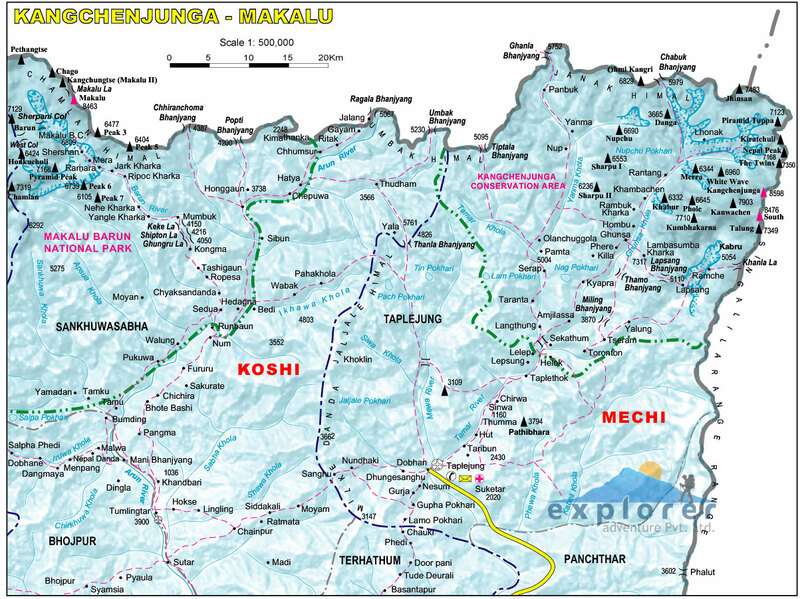 10 Day 10: Trek to Tseram 3,770 m - 05 hrs.Morning walk follows river banks passing a bivouac caves, then walking along the right bank of Simbua Khola heading along the mountain flank on the forested area of rhododendron and pine trees, then reaching at Wahta with a single hut, then crossing a stream along the path the views of the mountains are obstructed in this thick forest, but our walk continues coming to a gravel ground, trekking past this area leading to a shrine with a large boulder with a serpent shaped like, after leaving the forested area route leads towards a riverbed again, then with a climb to Tserem for our overnight camping with several roofless bivouac caves a shelter for the porters, just in front views of Yalung glacier and Kabru 7,353 m and Talung 7,349 m peaks. 11 Day 11: Trek to Ramche 4,360m via Lapsang - 05 hrs.After a lovely morning here at Tserm walk leads to a descent towards Simbua Khola riverbed, from here leading to a climb up on terraced hills arriving at Yalung Bara with single stone hut, this hut marking the end of the forests with mountain trail ahead towards Yalung Glacier ablation zone. From here leading to a climb for an hour with rest of the walk on gentle trail as the tree line ends at Yalungbar with views of Kabru, Rathong and Kokthang, the walk stops around this lovely area for overnight camp. 12 Day 12: Rest day at Ramche for acclimatization and walk to South Base Camp.Today a rest day after a week of tough walks, morning after breakfast hike and explore Kanchenjunga South Base Camp with nice and clear views of Yalung Glacier and Mt. Kanchenjunga South Wall. Walk takes about two hours at an altitude of 4,600 m on a classic route of first British Expeditions to Mt. Kanchenjunga in 1955. From here great views of Talung and Kabru Peak, after a nice pleasant hike with awesome panorama return back to Ramche for overnight. 13 Day 13: Trek back to Tseram - 04 hrs.Retrace the journey back to Tserm, starting with downhill most of the way to and back to tree lines and enjoying the views along the way to Tseram for overnight stop. 15 Day 15: Trek to Ghunsa 3,480m - 06 hrs.From here onwards heading towards North Kanchenjunga Base Camp, morning walk starts with a gradual walk then with a steep downhill for an hour through rhododendron and pines forest, the downhill continues till it reaches a level ground near Ghunsa River, from here walking on a pleasant and gradual path towards Ghunsa village, which is inhabited by a large Bhotia ethnic tribe of people of Tibetan origin community with stone houses and neat small farm village, overnight camp is set near Ghunsa village. 16 Day 16: Trek to Kangbachen 4,000m - 05 hrs.Starting the day with an strenuous uphill climb up along the river side looking around several wonderful cascading waterfalls as the morning walk progress, from here on coming towards Yak herders along the walk, which depends upon grazing time season. The walk continues from the right bank of Ghunsa River, through rhododendron and pines forest, and then slowly ascend to Rambuk Kharkas crossing a small glacier landslide sections, walk continues with amazing views of Khumbukarna Himal and Janu Himal and other high snow capped mountains, then leaving the tree lines behind towards barren landscapes with only sparse vegetation of junipers and Burberrys bushes , after Rambuk Kharka, climb through a large landslide area with a excellent views of Khumbakarna's Himal North Face. The walk form here leads to gentle descend to Kangbachen for overnight stop and this valley, which is dominated by Mt. Sharphu 7,070 meters and just in the opposite side lies the huge North face of Mt. Janu and Wedge peak. 17 Day 17: Trek to Lhonak 4,780 m - 05 hrs.After a lovely time with awesome scenery, morning walk follows above the river for an hour and then heading towards North East, the path leads down to the river and then climbing on the boulder track leading to a terminal moraine of Kanchenjunga glaciers, after Ramtang Kharka (a Sheppard huts and shades) the path leads to Kanchenjunga glacier, then crossing at the junction of Lhonak and Kanchenjunga glacier then reaching to our overnight camp at Lhonak with stunning views of Mera, Nepal Peak and Wedge Peaks. 18 Day 18: Trek to Kanchenjunga base camp at Pang Pema 5, 143 m - 05 hrs.Today adventure leads to our final destination to Pang Pema the North Base Camp of massive Mt. Kanchenjunga, morning walk leading to climb high above the river with superb views of Kirat Chuli, Nepal Peak, Taple Sikhar, and Givegela Chuli. The first section of the uphill climb is gradual and then heading unto a boulder trail, walks continues between a grassy slopes and glacier path up towards North Base Camp to our highest overnight camp of this impressive and remarkable adventure, around these area chances of seeing some wildlife a herds of blue sheep's and some mountain antelopes, if lucky the elusive rare Snow Leopards. 19 Day 19: Rest day at base camp / Pang Pema for local exploration,Our final highlight and destination of the adventure with free and rest day for optional hike or either rest at Base Camp, where you can marvel surrounding beautiful scenery and climb up to Pang Pema Peak above 5,800 m high. 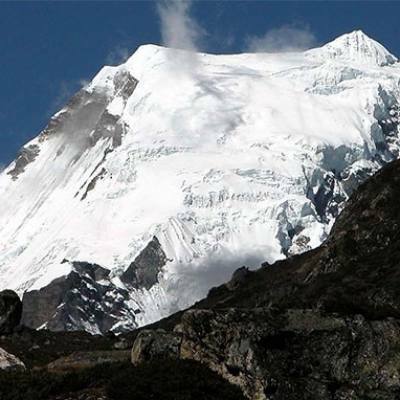 On top Pang Pema Peak offers panoramic mountain views, the climb is a mixture of boulders, moraine and grassland. From the top rewarded with mind blowing views of Kanchenjunga, Khumbakarna, Makalu, Cholatse, Sharpu, Nepal Peak and range of other snow capped peaks. 20 Day 20: Trek to Kangbachen 3,900 m - 06 hrs.After the most memorable and fabulous time at Pang Pema and tough climb on top Mt. Kanchenjunga, morning walk leads to a long descend with few short climb and the retracing the journey back by the same route to camp at Kambachen. 21 Day 21: Trek to Phole 3,100 m - 06 hrs.After the most memorable and fabulous time on Kanchenjunga Expeditions and North Base Camp, morning walk leads to a long descend with few short climb and the retracing the journey back by the same route to camp at Ghunsa, after crossing Ghunsa Khola the walk is pleasant through the pine forest to a very interesting Sherpa village of Phole. 22 Day 22: Trek to Amjilassa 2,500m - 07 hrs.Our journey continues with a descend coming across rich vegetation and back to tree lines, through mix forest of bamboo and rhododendrons. Before Gybala village walk is about half hour steep climb, then on the bank of Ghunsa River, walk gently climbs and with down hills for an hour and leading to a steep up and down again for two hours through the forest and finally reaching open grassland at Amjilassa, a small Sherpa village with overnight camping on a nice grassy field. 23 Day 23: Trek to Tapethok 1,300 m - 06 hrs.From here onwards getting back to lower altitude back to farm land and more villages, morning walk begins with a gradual trail and then descending through open grassland to Ghaiya Bari and Sekathum villages, from Sekathum crossing Ghunsa and Simbhu Rivers then following Tamur River to reach our overnight camp at Tapethok village of Limbu (Subba) Kirat ethnic tribe people. 24 Day 24: Trek to Phoram 1,650m - 06 hrs.After this Limbu village of Tapethok, journey continues on the left bank of Tamur River and to Chiruwa village, then walking for an hour through the several farm villages, walk leads to an uphill through mix forests of rhododendrons, oaks and pines trees, after leaving the forest the walk gets better on the pleasant trail then reaching to our overnight stop at Phoram village, this is fairly a large and neat village with afternoon time for walk around this pretty village of Phoram. 25 Day 25: Trek to Suketar 2,440 m - 05 hrs.Today, our last day trek of this awesome adventure as walk ends at Suketar, after a great time at Phoram village, our route leads to many villages and into cool forest of mid hills, the people around are of mix race, and then a steep climb for couple of hours and with gradual and pleasant walk all the way to Taplejung village at Suketar for overnight stop. This village with an airstrip that flies to Biratnagar and Kathmandu, due to unpredictable and with only few flights available, using flight from Bharatpur instead from Suketar to be on the safe side with our standard itinerary schedule. 26 Day 26: Drive to Fickal or Bhirtamod / Bhardrapur.After a grand time up in the hills and mountains, morning starting with an interesting and scenic drive leads on the rough jeep track to Ilam town and onwards to Fickal town which is near to the border of Darjeeling a hill station in India famous for teas and as well Ilam area. Drive leads through interesting vast sea of tea-gardens and rolling hills till Fickle town is reached, as per the time permits, we continue drive towards main highway that connects east and western Nepal at Bhirtamod or Bhardrapur town to make it easier for next day flight back to Kathmandu. 27 Day 27: Fly to Kathmandu and transfer to hotel.Morning transfer to Bhadrapur air terminal for scenic flight back to Kathmandu, on reaching Kathmandu airport, transfer to your hotel with rest of the day at leisure with grand memories of Kanchenjunga Base Camp trekking. 28 Day 28: Depart for international flight home ward bound.Your last memorable day in Nepal after a wonderful experience and adventure on Kanchenjunga Base Camp Trekking with great service of Explorer Adventure, and as per your international flight then transfer to Kathmandu international airport for homeward bound or to your respective destinations. Domestic flights fare as per the itinerary from Kathmandu-to-Kathmandu. Highest elevation gain: 5,143 mat Kanchenjunga Base Camp. Region of Journey: Nepal Far North East Himalaya. People and Culture: Sherpa-Rai and Gurung people with Magar hill tribe of both Buddhist and Hindu religion.